Regular readers will be well aware of my love/hate relationship with hiking: love the view, hate the uphill walking. I decided it was finally time to take steps (both metaphorical and actual) to remedy this and committed to doing at least one proper hike per month during 2017 in my New Year’s resolutions post. 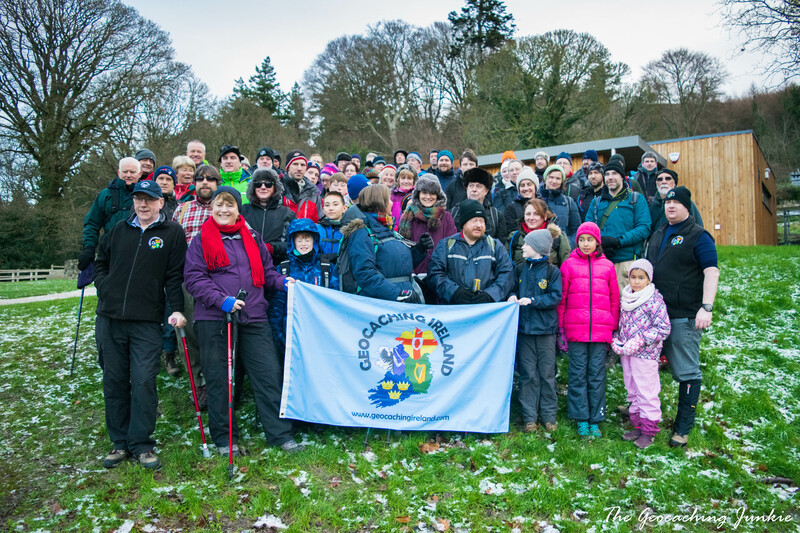 It had been quite cold in the week following up to the event, with a few snow flurries and frost, but the temperature had risen somewhat on the day and it was cloudy but dry. We hadn’t counted on the conditions at higher elevation though, and the road up to the starting car park was very icy. A decision was made to direct people to the lower car park instead and walk from there, thus adding that extra burn to the legs! Off we set after the prerequisite group photo, to the ‘start’ of the walk, at which point I already felt like I couldn’t go on. Yes, I definitely need to do this more often! It’s not how long it takes to get there, as long as you get there. That’s what I kept announcing multiple times throughout the walk, trying to convince myself more so than anyone else. 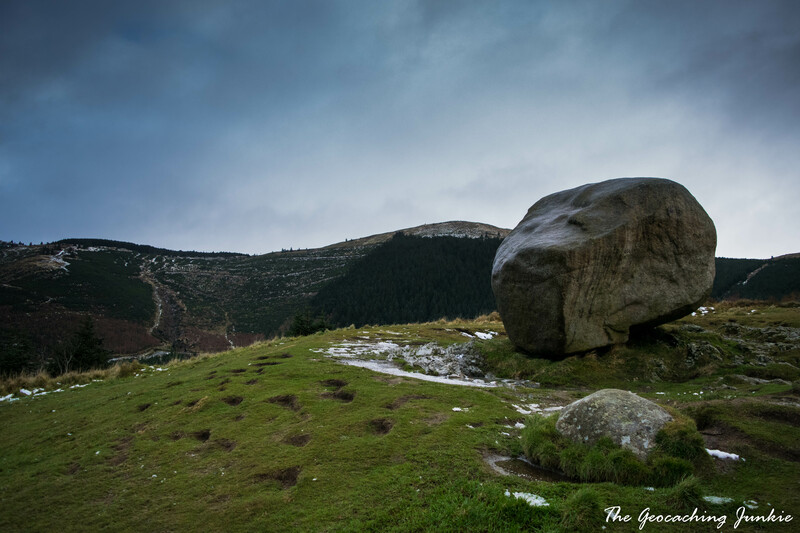 The Cloughmore Stone is thought to have been transported here from Scotland during the last Ice Age (110,000 to 12,000 years ago). 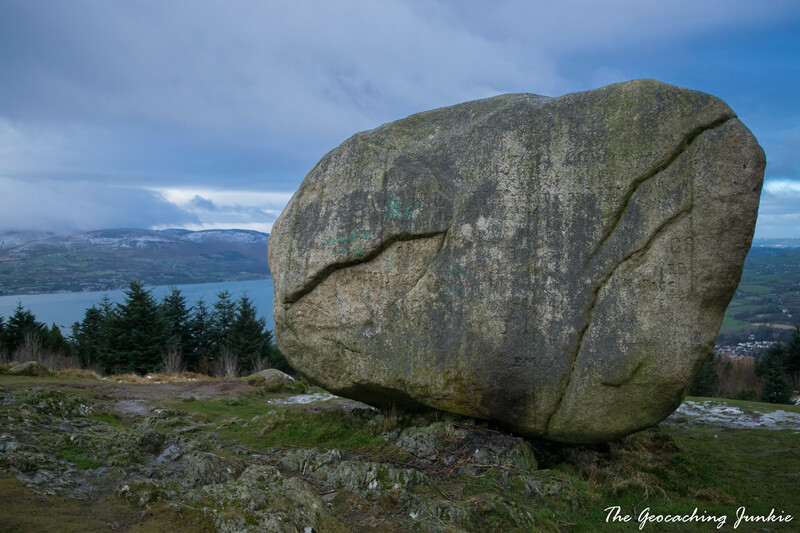 An alternative theory is that the rock was thrown here from the Cooley Mountains, at the other side of Carlingford Lough, by legendary giant Finn McCool (of Giant’s Causeway fame). 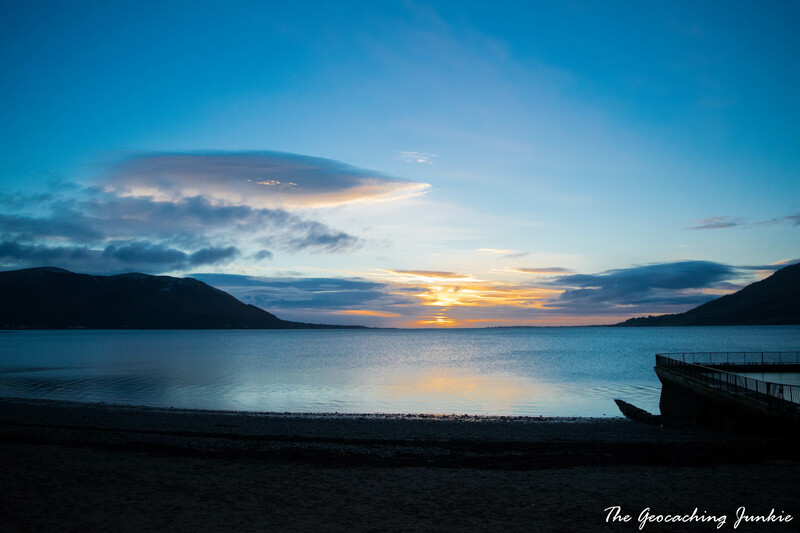 The erroneously named Carlingford Lough is not, in fact, a lake but a fjard, which is like a fjord but slightly less dramatic. Fjards, or fjärds, are formed following the submergence of a glacial valley and are usually more irregularly shaped than a fjord. 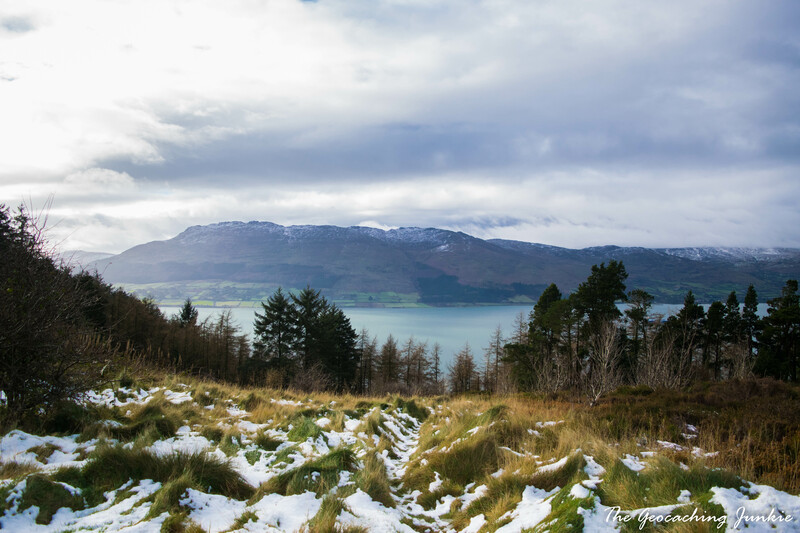 Speaking of fjords and fjards, the view was quite Nordic in appearance, with the still water of Carlingford Lough set against a backdrop of the Cooley Mountains sprinkled with snow. 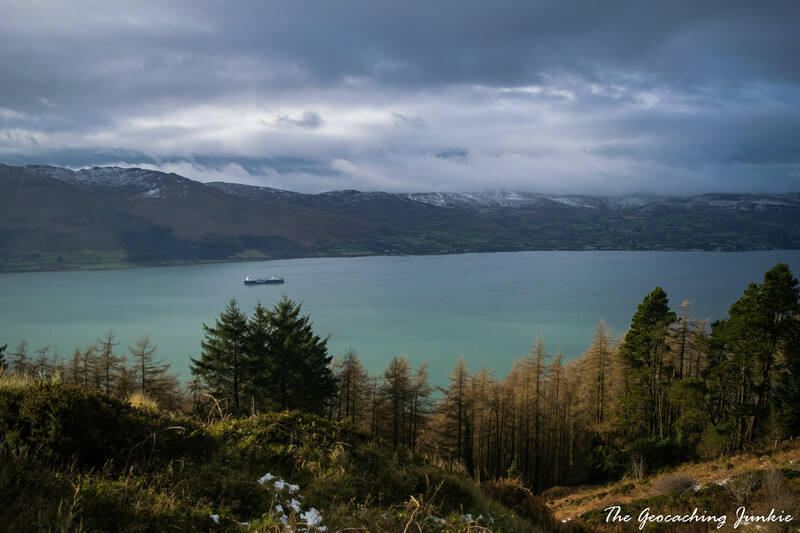 This is usually the point of the hike at which I think, “here is the reason I struggle up hills.” The view over Carlingford Lough was that part. We weren’t even half way finished the walk yet, though. 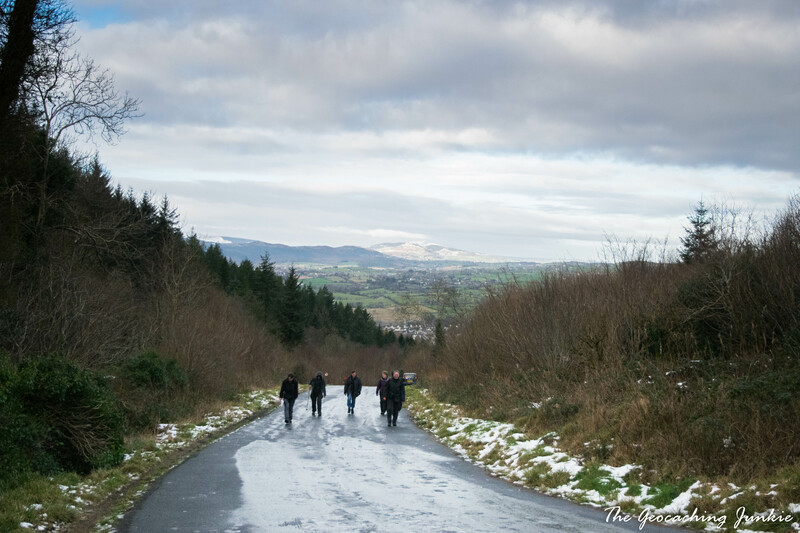 Hopeful that the worst of the dreaded uphill climb was over, on we pushed in the direction of Slieve Martin. I think it goes without saying that I was part of the group holding up the rear. 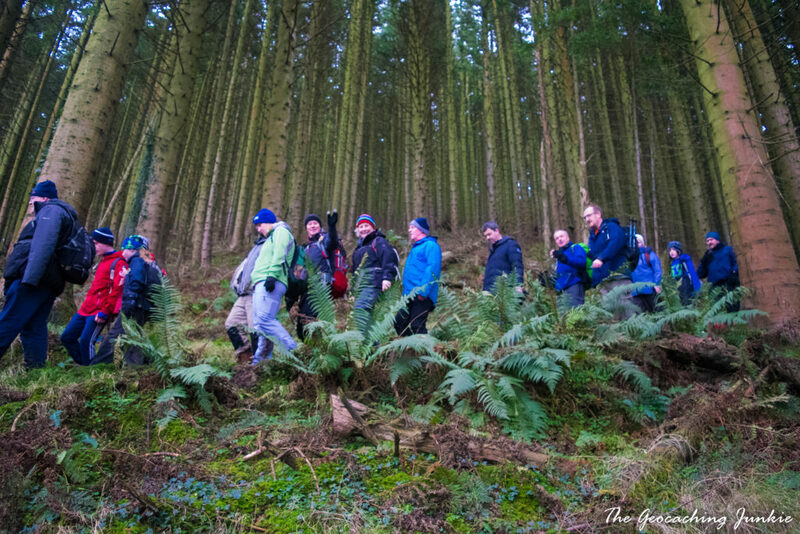 It can occasionally feel more pressurised to hike in a large group of varying abilities, but to reiterate my oft-repeated mantra, it’s not how long it takes to get there, as long as you get there. This phrase, combined with the unending encouragement of the group, is a great help when I’m flagging. 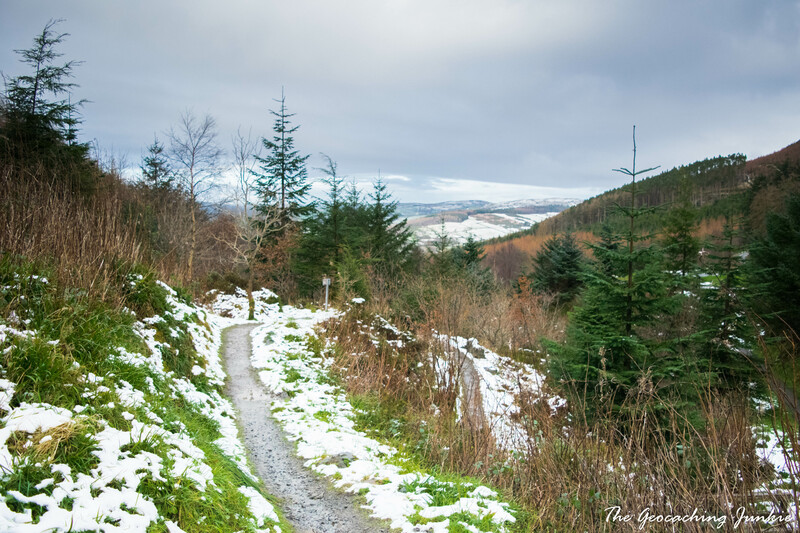 We don’t generally get much snow in Ireland, but the small amount that remained here and there definitely enhanced the views as we made our way around the trail. Probably my favourite part of the hike – and not just because it was downhill – was the walking the narrow trail between the tall trees. 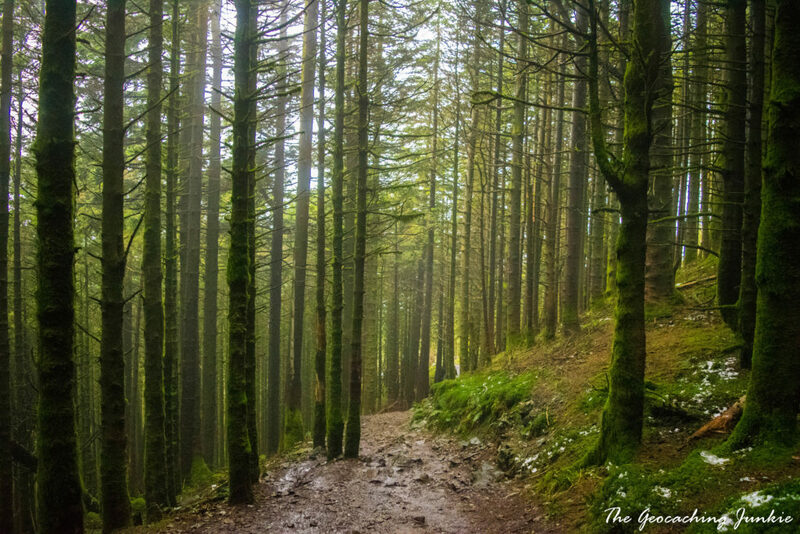 A forest of moss-covered trees has a definite air of the mystic about it and is my favourite type of location to go for a walk. Incidentally, one of the trees in Kilbroney Forest Park was voted Northern Ireland’s Tree of the Year 2016: a huge Holm Oak leaning at a 45 degree angle. We were almost back at the car park at this stage and as is the usual with these things, I was feeling very accomplished, as well as quite sore. 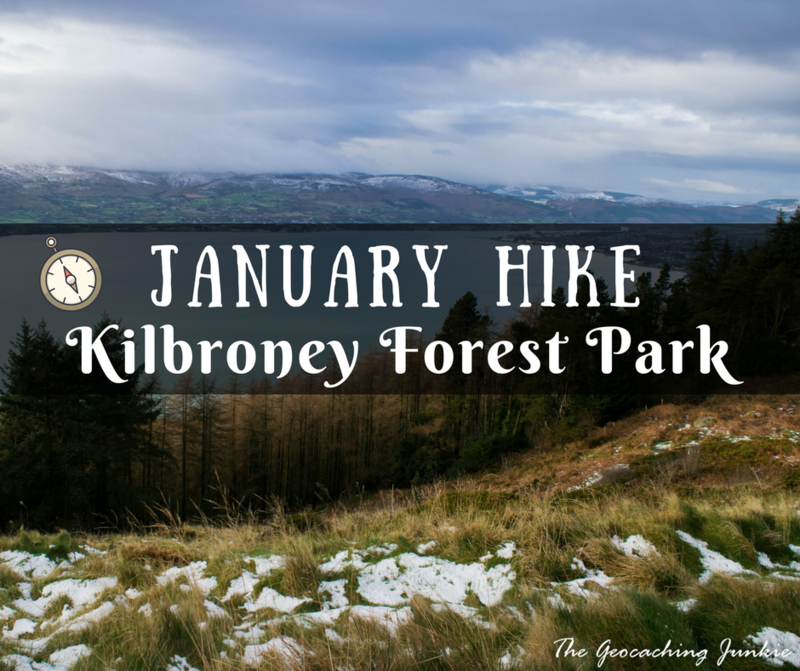 A fantastic way to kick off the geocaching year once again and the first month of my resolution done and dusted in great company! Do you enjoy hiking? Or are you more like me and tolerate it for the views and sense of achievement? Let me know in the comments! Well done for finishing. I gave up about 200m from the Bike or Hike Cloughmore Stone cache. Didn’t like the look of the steep muddy uphill bit. 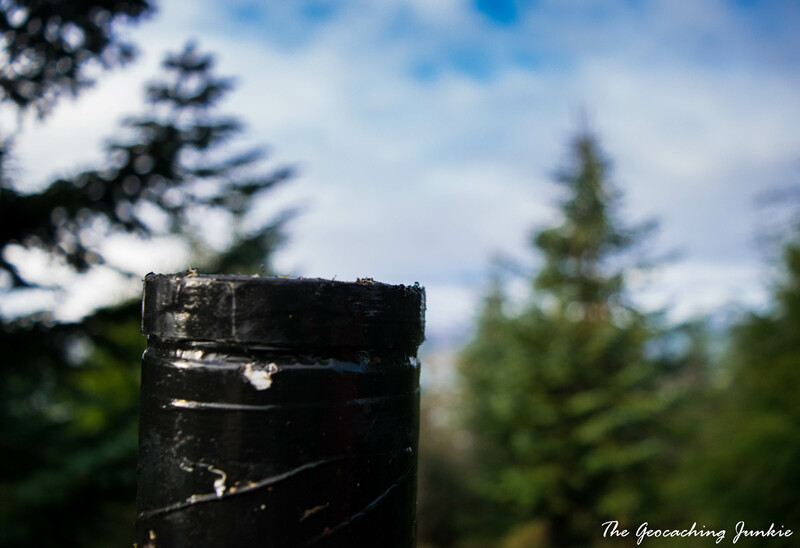 Might go back in the summer to look for the caches when I hope it won’t be so muddy. Enjoyed this blog, also interested in geology and geography. Nothing like a few erratics to get you going. See you soon. 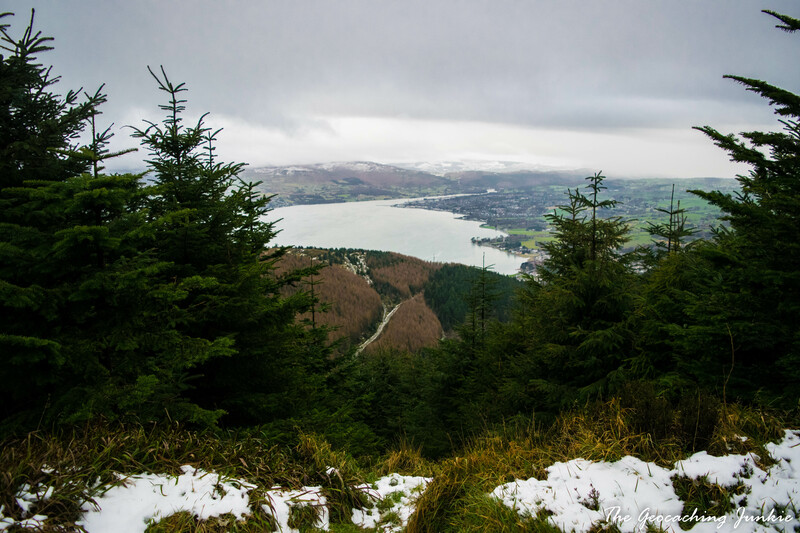 I think I’m in the same boat – I love hiking, but not the uphill bits. And these days, my knees don’t much like the downhill bits either! I really need to get out hiking more often!